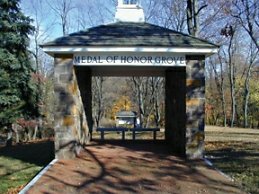 On March 8th, 2011, State Senator Andy Dinniman announced that his legislation to designate a section of Route 23 as the Medal of Honor Grove Highway was approved by the Senate Transportation Committee. “This is a great way to honor our veterans and to remind residents that the Medal of Honor Grove, a unique and historic memorial site, is located right here in Chester County.” Dinniman said. The Medal of Honor Grove was established in 1964 as a memorial to the men and women who have received the Medal of Honor since the Civil War. On each state’s acre, there is an obelisk patterned after the Washington Monument that has the state’s seal, dedication plaque and a list of Medal of Honor recipients from that state. There is a steel marker with the name, rank, unit, date and place of action for each Medal of Honor recipient planted in the ground and placed on the acre. A tree was to be planted for each medal winner. Outside of the Medal of Honor Museum, which is located on the USS Yorktown in Mount Pleasant, S.C., this is the only other memorial to all the Medal of Honor winners in the nation. Dinniman became involved with efforts to restore and save the grove after it came to his attention that the site had been allowed to fall into disrepair and may be sold to a developer. He said that designating the highway for the Medal of Honor Grove would be a fitting tribute to all Medal of Honor recipients, while helping raise awareness of the memorial site. Dinniman said he was contacted by many people concerned that the Medal of Honor Grove was unimportant to the foundation and, in addition to not being properly maintained, was in danger of being sold. “The Freedoms Foundation in Valley Forge maintains the Medal of Honor Grove and has chapters in a number of areas around the United States that educate young Americans about America. For a number of years a few of these chapters have been complaining to the Board of Directors at Freedoms Foundation at Valley Forge about the conditions at the Medal of Honor Grove. A chapter in the mid-west offered to raise large sums of money to maintain the Grove, Charlestown Township offered to purchase the Grove and put it into perpetuity, but were turned down. A family of a Medal of Honor recipient wanted to replace the dead tree that was placed there in their son’s honor, but were refused permission. Approximately 12 or 14 men of the Military have earned the Medal of Honor in Iraq and Afghanistan and nothing has been placed in their honor at the Grove. There are also 4 men from the Civil War yet to be recognized. Members of their own Board have resigned as a result of the above actions. Dinniman wrote to the foundation asking why the grove had been allowed to fall into disrepair. The Freedoms Foundation at Valley Forge in a July 30 open letter defended its actions in concentrating its financial resources on its educational mission rather than in maintaining the Medal of Honor Grove. “We intend no disrespect to the Medal of Honor recipients; however, the cost of maintaining the 52 acres is huge and has been a struggle for some time,” wrote Michael Di Yeso, president and CEO of the Freedoms Foundation. Dinniman said he met with Di Yeso and other Freedoms Foundation board members July 29th, 2010. In an interview regarding that meeting, Dinniman said he endeavored to point out to the men “that it would be inappropriate to diminish the significance of the grove to promote the education program. “They seem to focus more on the educational mission rather than the grove. Dinniman organized three clean-up days for the grove and more than 1,000 volunteers participated. The Freedoms Foundation also organized clean-up days and between the two, the grove has been restored. Medal of Honor recipients Joe Marm, Sammy Davis and Jim Livingston pitched in to help and to thank the volunteers for their time and efforts.